P188103LF-SSSD is rated 2.8 out of 5 by 52. 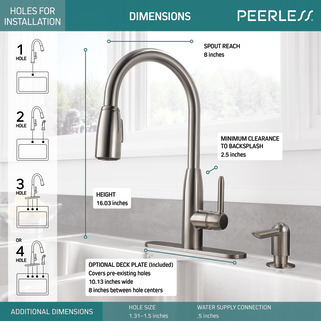 Rated 4 out of 5 by Mike0018 from The spray control button cover falls out I think the Peerless P188103LF is a great kitchen faucet. My only issue is the rubber cover keeps falling out of the button hole that changes the spray from stream to spray. I have put it back in several times but the last time it went down the disposal. I tried to find the part but it looks like I have to buy the entire spray part RP63202. I haven't bought it - -yet. I'm looking now for a plumbing junk yard that may have it. 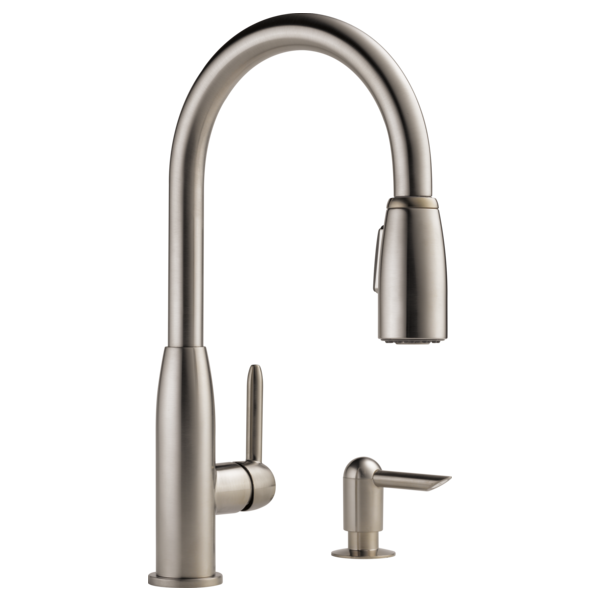 Rated 3 out of 5 by Camperfaucet from Decent faucet I bought this faucet probably 2yrs ago? I installed it in my camper to have a high ridse with pullout to wash pots easier. A good faucet for the little I use it( obviously only when camping) but on that little use the plastic(cheaply designed) broke and water everywhere under sink!! Thought maybe cause a camper and had some air that did this. I further looked into “my” problem and realized that many others had the same issue. So with that being said I called customer service and WOW the girl that helped me was very nice and very sorry about my issue. Told her about a 1-1/2yr to maybe 2yrs old. She quickly sent me a replacement out for me! No shipping or $ needed at all! So for customer service I would give a 5 star!! 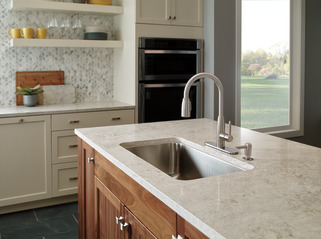 The only problem is NOBODY likes to go BACK under ANY sink to RE-DO a faucet that shouldn’t have broke so soon! Rated 2 out of 5 by Chardavis13 from sprayer stopped working I have only had my faucet a year & the sprayer part has stopped working. 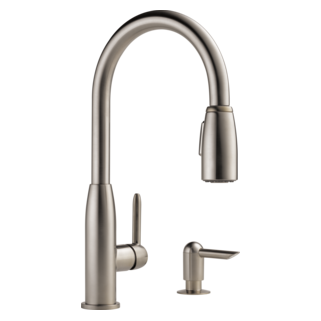 Rated 2 out of 5 by Kevin524 from Faucet failure very disappointed After looking at other reviews I find that I agree with many. It is a good design and stylish but the faucet/sprayer failed after 2 years. Very disappointed. When trying to locate the part number to purchase a new on I couldn't. I finally found the model at local hardware store and came to this site. Short term, worked great. Now it sticks between spray and full flow. Going to start to find a new head since this will be cheaper in short term then purchasing a whole new unit. Rated 1 out of 5 by Me from Leaks at the handle This faucet looks amazing, but after only 3 years it is steadily leaking at the handle. We have tried to remove it and clean per the instructions, but it would not resolve the issue. On a side note the soap dispenser broke after only a few months. Very disappointment with the durability. 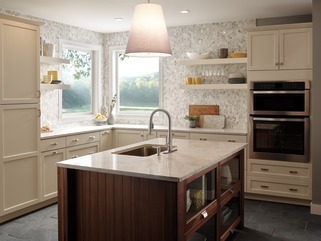 Rated 5 out of 5 by DrSnooz from Great faucet! I've purchased three of these faucets now. One for my kitchen, one for my camper and one for my 5th wheel. My oldest is 5 years old now and I have never had a moment's problem with any of them. One of the faucets was missing a piece when I got it and Peerless' customer support was very courteous and quick to ship a replacement. Thank you. I'm impressed that such an inexpensive faucet works so consistently and so well. The design is very simple, but still packs a lot of features. I mean, this is a high-rise, single-handle, pull-out spray-nozzle faucet. For these features, you could easily pay double for a real piece of garbage (like a dreadful Price Pfister, for instance.) 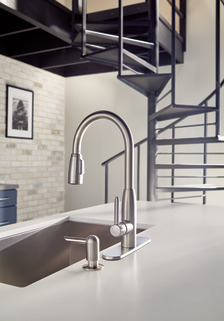 Instead, you get a quality, serviceable faucet that will work well for years. For those of you complaining about the soap dispenser: seriously? 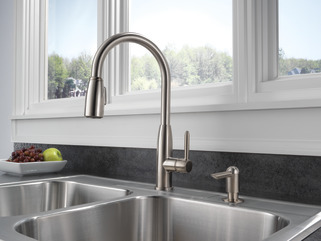 Just buy another dispenser and you've still saved money for a great faucet. I have yet to see a soap dispenser work for more than a few months. Sheesh. The only downside of this faucet is that the aerator is difficult to remove or clean out. If you have a lot of sediment in your water, this probably isn't the faucet for you. Otherwise, I highly recommend it! Rated 4 out of 5 by Hilda from Faucet works Great Disappointed by soap dispenser The faucet works fine. I am highly disappointed with the soap dispenser. Like many, the soap dispenser worked fine at first; however, stopped dispensing soap within the first six months. We are a family that washes dishes frequently in the kitchen sink, hence why we purchased a faucet with a soap dispenser AND made a permanent place for the soap dispenser on our new counter top. I would very much like to have the soap dispenser working again and came to the website to ask for Peerless' assistance in obtaining a new soap dispenser. Do you sell just the soap dispenser? I'd like to add another one on the other side, one for hand soap and one for dish soap. The soap dispenser pump nozzle does not secure or screw to the base, is that correct? This is peerless model 86630. Soap dispenser seems to be clogged &amp; doesn't dispense well even though I have dish liquid in it. It's junk. Just throw it out and buy a new one. 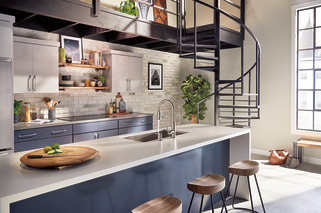 With a single handle side mount faucet. Is hot forward or to the rear? I know the spout is supposed to swivel but the part with the handle attached, should that move back and forth too?